Stone Boy, aka Dag Wentim of Zwen. 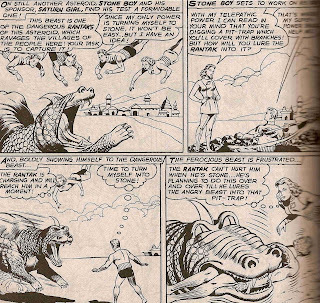 Created by Edmond Hamilton and John Forte. Stone Boy was one of the original members of the Legion of Substitute Heroes, and, like most of the rest of the Subs, joined the Legion for a little while during the Five Year Gap. We haven’t seen him in the reboot or threeboot, but he did have quite a memorable appearance in the animated series. Stone Boy’s problem is that his superpower really is kind of useless. He can turn to stone, and that’s it. This would actually be a good power if he could move around while he was in stoneform, but he can’t; he’s an inert statue. 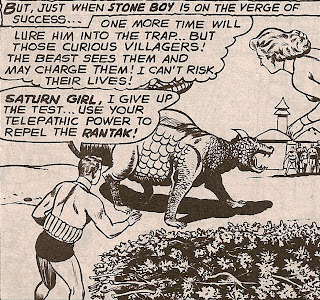 (In the Five Years Later stories, when the Subs are guerrilla fighters working with Universo to bring down the Dominion, it’s revealed that at some point Stone Boy learned some kind of self-hypnosis technique that allowed him to remain animate in stoneform, which made him suddenly very useful, but that may actually have been the last significant appearance of the character, so it was sort of too-little-too-late.) What Stone Boy really has to bring to the table is heart. He’s going to do as much as he can with what he has, not because of his ambitions, but because he’s in this to help people. 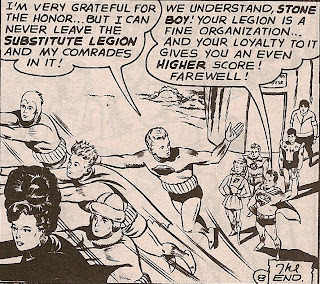 In his signature appearance, in Adventure #315, the Legion has just recently learned of the existence of the Substitute Heroes, and are quite taken with the idea. So they figure that they’ll give these kids another chance to qualify for the Legion, and set up a friendly competition. Each Sub will be given a task, and be scored on how well he or she accomplishes it. Whoever gets the highest score will be invited to become a Legionnaire. 1. Getting the job done is more important than winning some little contest. Stone Boy was willing to give up his chance to join the Legion, if it helped the villagers against the monster. It’s the same choice Superboy made three times in Adventure #247, and it’s the right choice. 2. Stone Boy isn’t auditioning to be a solo superhero; he’s trying out for the Legion. And the whole point of the Legion is that there are always fifteen, twenty other people around who can help you if you ask. ...which itself was great for several reasons. The Subs started as a secret organization, one that held itself in reserve until it was needed in the Legion’s absence. They never sought or received any publicity, and in fact kept the Legion unaware of their existence for a long time. And then there was the story where they thought the Legion actively disapproved of them, to the point even of declaring war on the Subs. That wasn’t the real Legion, of course; when the real Legion found out about them, they thought the Subs were great. But a question remained, at that point: were the Subs just a bunch of wannabe Legionnaires, or had they built something that would stand on its own? 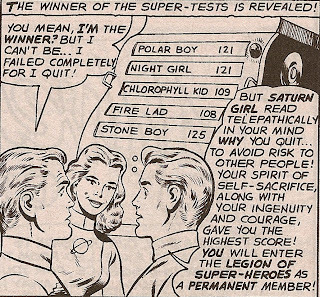 Stone Boy settled that question once and for all when he turned down the Legion’s offer.